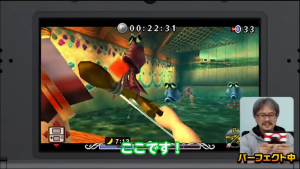 Nintendo’s Japanese YouTube channel recently released a short video showcasing the Shooting Gallery mini-game in Majora’s Mask 3D. Despite the video having no translation at this time, it’s relatively easy to gather what’s going on. With a minute and fifteen seconds to knock out as many red Octorok’s as you can- watch out for those dastardly blue ones!- at the cost of 20 rupees, the general concept remains the same. However, there are some key differences to the original game. For one, the red and blue colors are far more distinguishable now than they were before. Also, the shop’s décor has been given more detail. Most importantly, though, the gyroscope technology makes the movement of the bow more fluid. To most, this will increase the chances of getting a perfect score! Jump to watch Eiji Aonuma take a crack at getting a 50/50.